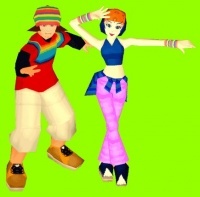 NI-NA and IZAM as they appear in DanceDanceRevolution 4thMIX. The only daughter of a couple of hippies who own a flower shop in the corner of a shopping district. She inherited the enthusiasm of her mother and her father's wish to protect the environment. Love & Peace is her motto. She's studying how to talk to plants. Part of the SPECIAL SELECTION duo in DanceDanceRevolution 4thMIX, along with IZAM.